Ragdolls are, for me, the cream of the feline world. The majority of those who are ‘slaves’ to Ragdolls now, or have been in the past, will probably understand why I say this, but for those who have not yet encountered Ragdolls, I shall try to explain just what it is that I think makes them so special. When I first set eyes on a Ragdoll cat, the initial thing that struck me was their size. They are large, muscular cats, with mature males reaching weights of 7–9kg (15-20lb) and females 3.5-7kg (8-15lb). Little wonder then, that Ragdolls are believed to be the largest of all domesticated cats. The second thing that struck me was the exquisite beauty of the Ragdoll, with amazing blue eyes, silky semi-longhaired coats, their neck ruff and ‘knickerbockers’ and striking colours and patterns. However, it is the truly wonderful nature of these ‘gentle giants’ of the feline world that really gives them their uniqueness as a breed. Ragdolls have the ‘purrsonality’ to match their size and beauty. They are loving, gentle and docile. The loyalty they afford their owners can be compared to that of a dog, as they are not independent and aloof, but crave company and attention, wanting to be with their owners at every opportunity. Once you share your home with a Ragdoll, you adopt a shadow, who will follow you everywhere and I mean, everywhere! In our house showering or bathing usually involves the company of at least one of our Ragdolls and as I write this I have two Ragdolls supervising me, as they drape themselves partly across my lap and partly across the keyboard. Our Ragdolls always greet us at the front door, when we return home, even if we have only been out to put rubbish in the bin, or cut the grass. Having a Ragdoll is not like owning any other cat. Once you own, or should I say are ‘owned’, by a Ragdoll, they become one of the family and you become their slave! Ragdolls generally have a quiet voice and tend not to meow continually, as some breeds of cat do. However they can be vocal and many are very competent at using a few well chosen sounds to communicate their feelings to their owners. With time it is possible to distinguish these sounds and begin to learn the emotions and moods they convey. The term 'lap cat is often used when describing the Ragdoll and while this is true for many Raggies, it is important to make the point that every Ragdoll is an individual and some do not enjoy sitting on their owners lap. That is not say they are not affectionate, but they prefer to sit close by or even better, on their owner's feet! Calm and a laid back in nature, generally Ragdolls will settle into most situations and will live happily with other pets and children. Ragdolls are fun and mischievous too. They love playing and make great retrievers, if a little time is dedicated to training them. Our Ragdolls enjoy a game of fetch the ‘mouse’ or ‘ ball’ and any games are played with exceptional Ragdoll manners, without claws or teeth! Ragdolls like to play with someone, not just on their own and they can be very persuasive at encouraging others to join in, once they have decided it is play time. A Ragdolls idea of a 'good toy' may not be yours. A favourite amongst our Ragdolls is grape stalks - don't ask me why but they just love them, with or without the grapes attached!! Any open box just has to be investigated and sweet tins are completely fascinating to a Ragdoll whose idea of heaven is a small ball of tin foil. Other such interesting items include straws, pencils, pens (especially if you're writing with them at the time), small ornaments, in fact anything they can comfortably carry and then loose. This can be intentionally, such as when placing inside your shoe, or accidentally under a heavy piece of furniture. The latter is usually accompanied by loud crying until you move said piece of furniture and retrieve the 'toy' for them. Christmas and Birthdays are particularly fun times for Ragdolls when there is lots of wrapping paper to pounce on and shred. **Warning** When wrapping presents, it is advisable to remove all Ragdolls from the room before they decide to 'help'! So Ragdolls are big and beautiful, and they have the most endearing characters I have ever observed in a cat. That to me is why I am so utterly enchanted by them. Given plenty of love and attention, Ragdolls will reward their owners many times over with their own special brand of loyalty and affection, but be warned, Ragdolls are totally addictive! 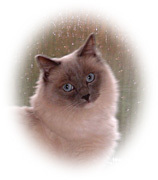 To find out if the Ragdoll is the breed of cat for you, please visit our Right for You page.